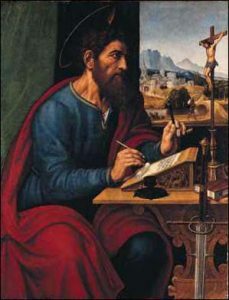 St. Paul, Patron saint of writers, pray for us! English Language Arts (ELA) is an umbrella phrase to describe what many recognize as grammar, applied writing, spelling, vocabulary, reading, and literature- all disciplines related formally to the arts of literature and writing. The objective of ELA classes can be summarized as: to think well, to speak well, to listen well, to read well, and to write well. Combined with religious instruction, ELA is the most morally and intellectually formative subject in our curriculum, and therefore arguably the most important practical discipline. During the primary and early elementary levels (grades Pre-K-2), careful attention is paid towards laying the foundation for solid reading, writing, thinking, and listening skills later on. Students are introduced to their letters, phonics, and rudimentary grammar concepts; read-alouds are often employed within the classroom setting as well. We employ a combination of basal readers, picture books, and chapter books to cultivate a variety of foundational reading skills. Further, by grade 1, students are introduced to Latin in order to master word decoding skills through the time-tested mastery of word roots (approximately 50-60% of English words are derived from Latin). Essentially, we seek to employ the best methods of early childhood literacy, which are a combination of time tested strategies and contemporary innovations. Intermediate grades (3-5) focus on the complete mastery of critical skills learned in during the primary grades, but with an orientation towards the reading of texts, discussing those texts, and writing about them. We stress the value and role of traditional English grammar as well. Our texts include a certain canon of classic texts (typically abridged classic literature texts, the lives of the Saints, and stories from the Bible) which provide crucial background knowledge for the reading of unabridged texts later. However, we balance this with the continued use of textbooks, writing assessments, and informational texts. Additionally, students will continue with the methodical study of Latin, moving from one day a week to two days a week (grade 3) and 3 days per week (grade 4), with not only the continued study of important word roots, but introductory grammar concepts. By the end of fourth grade, students should have a good foundation in English grammar, acquaintance with morally formative core texts from Western tradition, and a mastery of core writing skills. By fifth grade, students will take four days of Latin per week, mastering the first and second conjugations, 150 Latin word roots, a host of classical phrases, the basic prayers of the Rosary and Mass, and all five noun declensions. Last, fifth grade students will divide into Honors and Regular Literature for the study of classic pieces of literature within the context of our Diocesan curriculum. The Middle School levels build upon the foundation laid in the elementary grades, culminating in mastery of the writing process and the analytical reading of more sophisticated texts. The objective of our sixth grade writing curriculum is a complete mastery of English grammar concepts and the writing process. Students on this grade level will intensively review and learn all grammar concepts, apply the writing process to the most common writing genres, and analytically write in relation to texts read in Literature, Religion, Social Studies, Music, and Art classes. It is on this level that students begin to move away from traditional textbooks and into the world of classic literature; however, we strive to balance such readings with non-fictional texts as well. At this level, the students study approximately 20 new English vocabulary terms/week, and will gain mastery of approximately 150 new Latin roots per year. Currently, all sixth graders study Latin four days per week with a Latin instructor. The grammar concepts studied in Latin are contrasted with English to reinforce an orderly, systematic approach to language. By the time our students reach seventh and eighth grades, the expectation is that they can engage in a more rigorous curriculum that is literature and writing intensive across all subject areas. While the emphasis on technical grammar begins to wane, we continue to review such concepts through applied writing strategies. With respect to writing, the emphasis culminates in more applied writing activities, with a review of the most sophisticated aspects of English grammar (such as clauses, transitional phrases, etc.). Students on these grade levels are expected to read, discuss, and write in relation to numerous texts, novels, and non-fictional pieces throughout the year. Our goal by the end of eighth grade is to produce students who are accustomed to habitually read, discuss, and write, thereby cultivating the five critical language arts skills: thinking (logic), reading, writing, speaking, listening. Finally, as students continue their studies in Latin (four days per week), they are prepared to read simple classical texts in Latin and take the National Latin Exam. With respect to Latin, our goal is to prepare students to read Western literature in its natural tongue- the two languages in which most of the classic texts were originally composed (Latin and English) and are the most relevant to English speaking culture. Parental and student acceptance of the responsibilities of an honors student.